We are approaching the final two weeks of the Soles 4 Souls Flippin Good Deeds Challenge sponsored by Flip Flop Wines. Last night while the snow was coming down here in Denver, my sister and I started our first Sole Spellathon. 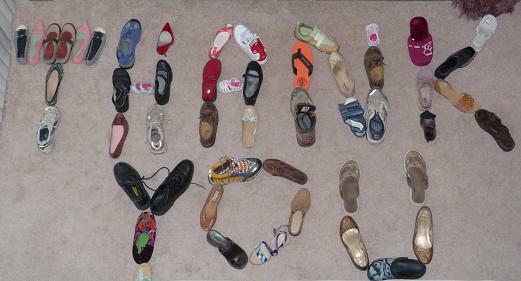 We had lots of donated shoes to choose from and this is just a sampling. Tomorrow more shoes are heading to the S4S warehouse in Golden. Friends and co-workers have been very generous and un'sole'fish with their used shoes. ﻿Thank you sole much! If you still want to get in on the fun, please click here to learn about the challenge and how to donate your used shoes.